Vega Prostate Formula provides specific antioxidants, vitamins, minerals and herbs that may help to support the health of the urinary system. Dietary and lifestyle changes may play a key role in prostate health. A diet that is good for the heart is good for the prostate. This consists of a healthier balance between omega-3 and omega-6 essential fatty acids. It does not include much red meat which is high in omega-6 and emphasizes foods rich in omega-3 such as, fresh fruits and vegetables, whole grains, pulses, garlic, olive oil, fish and moderate red wine consumption. It is also important to get adequate fluids such as water and to avoid foods with added salt and sugar and those that are high in fat such as, processed and refined foods. Vitamin C (Ascorbic Acid), Vegetarian Capsule Shell (Hydroxypropyl Methylcellulose, Colours (Titanium Dioxide, Copper Chlorophyllin)), Anti-Caking Agents (Silicon Dioxide, Magnesium Stearate), Saw Palmetto Berry Standardised Extract (Serenoa repens), Grape Seed Extract (Vitus vinifera), Green Tea Extract (Camellia sinensis), Bee Pollen Extract, Vitamin E, D-Alpha Tocopheryl Aceate), Sodium Borate, Acacia Gum, Sodium Selenite. 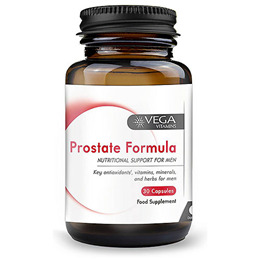 Below are reviews of Vega Vitamins Prostate Formula - 30 Capsules by bodykind customers. If you have tried this product we'd love to hear what you think so please leave a review.